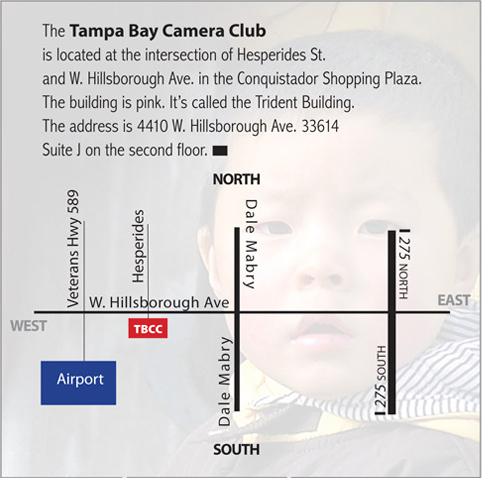 Tampa Bay Camera Club | Share & learn with us. Everyone welcome! Please remember that there will be no regular club meeting on Friday night 02-22-2019. Instead we are having a photo scavenger hunt field trip the following morning, 02-23-2019 at Hillsborough River State Park (HRSP). 15402 U.S. 301 North Thonotosassa, FL 33592. Plan to meet in parking lot 3 between 9:30 and 10:00 am. This is the largest parking lot in the park. It is not the parking lot by the pool, that is lot number 4. If you pass parking lot 3 by mistake then you may park elsewhere and walk back to lot number 3. Allow time to get through the line at the entrance as the park is popular and busy on Saturday mornings. Carpooling is encouraged as this will minimize the number of vehicles that we will have in the entrance line and it may lower your cost. Admission is $6 per vehicle. We will review the rules and start the event at 10:00 am. We will reconvene at noon to score the event. It is suggested that you bring a lunch to eat at this time. There is a food concession in the park as well. Bringing some water to drink and a snack to eat while out photographing in the park is also recommended. All photos must be taken inside the boundaries of HRSP on 02-23-19 between the times of 10:00 am and noon. Only one photo of each list item will count for points. (Example 1: If you take 3 different photos of various types of yellow flowers, only one photo may be counted. Example 2: If you have a single photo that contains multiples of any item other than an animal being counted for points it still only counts for once. A single photo of 3 yellow flowers scores the same as a photo of a single yellow flower. Example 3: Multiple points for multiple items in a photo will be awarded on photos of animals. A single photo showing 3 turtles counts triple what a photo of a single turtle is worth.) There are mystery items as well. Be aware of interesting or unusual items that you encounter and photograph them even if they aren’t on your list because they might be a mystery item. The list of mystery items will be will not be revealed in advance. The regular list is below. The amount of points that each item is worth will be revealed during the scoring process. Please print the list below and bring a copy with you to the event or keep a digital copy on your mobile device for reference. Create interesting images of any subjects from an unusual camera. Low angle, high angle, tilted camera angle, etc. Create interesting images that are based on visual repetition of subject elements. Create compelling images using the night sky as the primary subject element. The night sky should not be secondary or incidental to the images. Create impactful images utilizing a single element as the subject while eliminating or minimizing other visual elements within the scene. Create well-composed images using either entire bridges or visually interesting portions of their structure. Create artistic images that represent the beauty and motion of the art of dance. Create well-composed images of any subject that is visually enhanced by any of the many forms of lens flare that can occur when light from a strong source strikes the front element of a camera lens. Create interesting images of any subject that is visually enhanced by having an obviously very out-of-focus background. Create compelling images where the primary subject is reflected on any surface or is strongly visually supported by reflections. Create interesting images where the primary subject is any form of moving liquid with the artistic goal being to specifically show the motion of the liquid in an interesting way. February 23rd Technical Meeting – Saturday morning photo scavenger hunt at Hillsborough River State Park. Arrive by 9:45 am latest, event starts at 10:00 am. Additional details to be announced. Attention: It is very important if you wish to attend that you completely read and understand the details provided in the event description below. 12-11-2018 Event Schedule Update – This information supersedes all previously posted information below and there is a new sign-up form! The weather looks pretty bad for the event. It is currently forecast to rain Thursday, Friday, and into Saturday and it will be very cold as well. This means that the site and the access road will be wet, muddy, and possibly not easily negotiated with 2-wheel drive vehicles. There is a possibility that SWFWMD will close the site and cancel the permits as they have done in the past when similar conditions have been forecast. They don’t want the site and the access road to get torn up by vehicles that get stuck in wet conditions. So far there hasn’t been an official announcement of site closure but it remains a possibility. I will make another announcement if that happens. In any case there will be no photo opportunities Friday afternoon/evening based on the current forecast. I’m officially canceling the planned activities for Friday under the circumstances. Saturday afternoon may hold some possibilities if the rain ends at a reasonable time. If the site does not close I will be there all day Saturday and will lead some late day photo activities and host a campfire meal in the evening as planned and hope for some night sky photo opportunities if the skies clear. If you wish to attend on Saturday please be aware that access road conditions may be bad and that you should bring rain gear and cold weather garb. I have removed the old sign-up form and have replaced it with a new one. Even if you signed up already please take a moment to fill out the revised form. Thanks for your understanding – Jim. If the road and/or field aren’t too muddy when you arrive feel free to drive your vehicles all the way into the field to unload your gear and then park on the edge of the field to keep them out of the way but close by. We want to keep the field as open as possible for campsites to be setup and to allow ample room for people and camera gear to be setup for night photography. Remember – cell phone service is spotty to nonexistent in the preserve. Make sure you are familiar with driving directions and have your GPS running well in advance of arrival. If you are using cell phone GPS navigation consider downloading an offline map of the area in advance to use. It is not certain that you will be able to call me or anyone else that has already arrived for directions or help. If there is anyone that is interested in attending overnight Saturday but doesn’t have a tent please contact me. I can arrange for a couple of extra tents and camping hammocks to be available. jim @ jrsphotos .com (spaces added to keep spam robots away – leave them out to get in touch with me). Remember to bring your own food, snacks, and drinks for daytime Saturday. Jim will provide food and drink for Saturday dinner. Jim Sykes is hosting a weekend of photography and fun at Pott’s Preserve on the Withlacoochee River. (2988 N Hooty Point, Inverness, FL 34453) It is scheduled to coincide with the Geminid meteor shower, often the best meteor shower of the year. Arrive late Friday afternoon or early Friday evening, December 14th and bring something to eat and drink. At approximately 8:00 pm Jim will give a primer on night sky/meteor photography in order to help everyone to be able to use their equipment to photograph the meteor shower as it reaches the peak Friday night through Saturday morning. There is also an option to arrive on Saturday if you are unable to attend the Friday night event. On Saturday morning, December 15th you are free to roam the many trails of the preserve and do landscape photography, flower photography, macro photography, etc. On Saturday afternoon Jim will be guiding a waterborne photo trip into the Gum Slough spring run. If you wish to take part in this portion of the event you are responsible for providing your own canoe or kayak and all legally required safety equipment. (Personal flotation device, audible signaling device, etc.) Saturday evening Jim will provide a campfire meal for attendees and Saturday night will provide another option for night sky/meteor photography. You may camp overnight on Friday night and/or Saturday night. Pott’s preserve is a primitive campsite. There are few amenities beyond a no-frills restroom. It is suggested that you bring your own toilet paper. If you are camping you are responsible for providing your own tent, or hammock for sleeping. Sites are first come, first served. There are fire rings and picnic tables located at various campsites as well as a few charcoal grills. Jim will provide the firewood for a community campfire on Friday and Saturday night and as mentioned above Jim will provide food and drinks for the Saturday evening meal. There are 2 permits in place to accommodate a grand total 25 people for the event. The event will be strictly limited to the first 25 people who sign up using the form provided below. Do not reserve a spot unless you are very sure you will be attending. There is a $10 suggested donation per attendee per night to cover the cost of firewood, food, drinks, ice, etc. You have an option to attend Friday only, Saturday only, or both. Campsites must be vacated by 11:00 am Sunday morning. If possible please arrange to carpool with other attendees to limit the number of vehicles and cut down on traffic within the campsite area. It is suggested that you consider parking your vehicle in the open area at the kiosk that is inside the gated area halfway to the riverside campground (not the one located at the entrance outside of the gate) rather than driving all the way in to the riverside campsite field if you do not have a 4 wheel drive vehicle. Vehicles can get stuck on the last section of dirt road or in the field if there has been rain. You will be emailed a copy of the campsite reservation and it must be printed and displayed on your dashboard. We do not have exclusive use of the venue so be aware that there will probably be other campers there during the course of the weekend. Be respectful of other campers especially with consideration to noise, lights, etc after 10:00 pm. Camping is allowed in designated campsites only and requires a free reservation. Campfires are permitted only in fire rings. Firewood should be collected from the ground; DO NOT cut any standing trees, dead or alive. Campfires must be put out completely. To protect the natural experience for all campers, no loud music is allowed at any time. Built-in generators are allowed at equestrian campsites only. Horses are only permitted in camp areas designated for equestrian use. Horses are not allowed in primitive campsites. Where permitted, dogs must be on a six-foot leash and be well-mannered at all times. Dog owners are required to pick up after their dogs; do not allow your dog to wander outside your campsite. No other pets are permitted on District lands. Quiet time is from 10 p.m. to 8 a.m.
Any additional rules and regulations will be provided on the reservation or posted at the campground kiosk. Canoe or kayak and legally required safety equipment. Please join us at tRG studio on December 13th at 7:00 pm for our annual Holiday party and awards presentation. As always, we will have a pushpin print presentation. Bring a print at least 8×10 inches in size to hang for display and tell us about it. (No pins will be pushed through your print by the way.) We will present the awards for the 2018 club photo competition and of course, we will have our famous pot luck dinner as always. Please use the sign-up form below to let us know what you will be bringing. Check the prior submissions to make sure you don’t duplicate something that someone else is already signed up to bring. The club will provide plates, cups, utensils, soft drinks, and ice. Click the link below to see the magazine. Congratulations to Susan! Join Jim Sykes of Hospitality Image Services and Robert Rostick of tRG Studio for an evening of fun and photography at Silverking Brewing Company, a craft microbrewery located in a historic building in Tarpon Springs. Multiple photo stations will be setup in the brewery featuring food from local establishments. Lighting will be provided at each station, no need to bring your own. Do bring your camera, a tripod, and lenses of your choice. Pizza will be provided for all participants and the brewery has an excellent selection of craft beers available for purchase to wash it down. There are a limited number of spaces available so register soon to reserve your spot at this fun photography event. $39 per person, click here to register. We are set to be at the last weekend game for the season (Sat &Sun), Saturday, Sept. 1. The game starts at 6:30, so I would suggest we arrive at 5:30 to meet out front. It is a promotion and “Fan Appreciation Night”, so there will be more activity than usual. There are 2 shooting bays located near the dugouts. Based on discussions with Mike Liberatore, GM, we can rotate individuals throughout the game. I will drop by the stadium to get a better understanding of where they are located and other shooting opportunities. The photographer shooting bays are much larger than they led me to believe (see pictures I took below). They are located behind first and third base. Each one can easily hold 6 people comfortably with mono-pods. A 70-200mm lens with a crop sensor camera would probably be ideal (pictures taken below were with a 70-200/full frame camera) to catch all in-field action shots. The group cost for the game is $5.00 per person. If you have any questions, please don’t hesitate to contact me. TBCC member Susan Louise Anderson will be the featured artist in the lobby gallery of the Carrollwood Cultural Center June 27th through August 26th. A reception for the 25 piece show will be held on Friday, August 3rd from 5:00 to 8:00 pm. Light refreshments will be served. Please take some time and visit the gallery to appreciate the the wonderful work of the artist. There are several parking garages and parking lots nearby as well as free 2 hour street parking. Looking forward to seeing everyone there! Attendees will learn how to: • Maintain curiosity and stay engaged. See the world with fresh eyes! • Be inspired by the best. We’ll explore the work of some of the world’s most talented artists. • Transform your art. Discover photography as a creative medium rather than just documentary, and see how to apply that insight to your craft. • Spark your imagination. Don’t just capture the moment. Create a vision that’s uniquely yours!